Chandigarh, March 27:- UT Home Secretary, Mr. Krishna Mohan was the Chief Guest on the Annual Day-2008 of the Chandigarh Institute of Hotel Management, Sector 42, here today. On the occasion, Mr. Mohan distributed awards to the students with outstanding performance in various fields like studies, sports and other extra-curricular activities. Mr. Mohan also released a magazine titled “Cater Craft” on the occasion. Addressing on the occasion, Home Secretary said that the UT Administration believes in various unique experiments and also get results at its earliest. He said that the Hotel Beckons established in the premises of CIHM was among such experiments which proved to be a great success. Mr. Mohan further added that students should not take the college period easily. They should identify the bitter truths of life and fight them. In the contemporary world of cut throat competition there is a dire need of a unique skills to out come others, added Mr. Mohan. Mr. Mohan said that to achieve success students should have good command of English, computer knowledge and above all the knowledge of subject along with getting degrees.He requested the students to toil hard and also accept the efforts made by their parents in making them successful. In this world of Information technology there are both good and bad things but students needed to recognize the one useful for them, added Mr. Mohan.Director Tourism, Mr. Vivek Atray, Principal, CIHM, Mr.S.K. 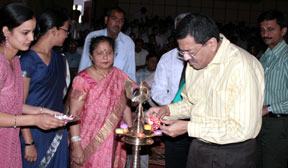 Saluja, faculty members and students were also present on the occasion.